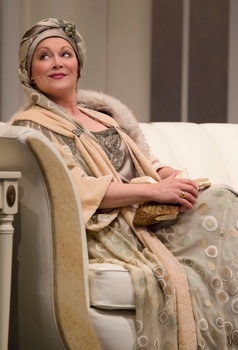 No doubt inspired by the huge success of the British series Downton Abbey on PBS, the Shaw Festival has made the smart decision of programming W. Somerset Maugham’s 1917 comedy Our Betters. One aspect of the background of Downton Abbey is that the penniless 5th Earl of Grantham has had to marry an American heiress Cora Levinson in order keep his estate running. American heiresses marrying impoverished European nobility is precisely the subject that Maugham satirizes in his play, written at a time when his audience would have had direct knowledge of numerous such alliances. Our Betters focusses on the young American heiress Bessie Saunders (Julia Course), who has travelled to London to stay with her sister Pearl (Claire Jullien), who has become Lady Grayston through her marriage to a baronet. Pearl is the queen bee of a social set in London that includes Minnie, the Duchesse de Surennes (Laurie Paton) and Flora, the Princess della Cercola (Catherine McGregor). Soon we discover that the French Duchesse and the Italian Princess were originally American just like Pearl, even though all three now sport British accents. Whether the three are happy that they have traded their wealth for a title and the entrée it gives them to the higher social circles is a moot question. Flora is separated from her husband. Minnie has divorced hers and gads about with Tony (Charlie Gallant), a boytoy half her age. Pearl is happy that her husband George is content never to be in the same city as she is. Though already rich, she is not rich enough to attract the level of society she craves and so does not balk at encouraging the amorous advances of the doting elderly American Arthur Fenwick (Lorne Kennedy), who bankrolls her extravagant clothes, jewelry and parties. When we first meet Bessie, she is completely caught up in social whirl of London and has managed to blind herself to the casual immorality of its members. Yet, she cannot bring herself to say yes to the continual proposals of Lord Bleane (Ben Sanders), who actually is in love with Bessie herself, not just with her wealth. Meanwhile, a former flame of Bessie’s, Fleming Harvey (Wade Bogert-O’Brien) has just arrived in London to visit his cousin Pearl and to see Bessie again. Unlike Bessie, he immediately sees through the pretenses of the ennobled Americans and their hangers-on like the ex-pat Virginian Thornton Clay (Neil Barclay) and only wishes he could persuade Bessie to see her social set as he does and return to America with him. Our Betters is a blistering social satire that comes down as heavily on the Americans as it does on the British and is surprisingly frank about sexual matters for a play from 1917. Maugham portrays the Americans as traitors to the egalitarian values of their homeland and ruthless social climbers. The British upper class he portrays as financial incompetents who would rather marry for money than learn how to work for a living. The play is filled with Wildean wit and even when the action seems headed for melodrama, Maugham draws humour from how characters are able to turn potentially disastrous situations to their advantage. Morris Panych directs the play with flair and a trenchant understanding of the characters and their various situations. He has the advantage of an ideal cast for the play. Claire Jullien,who has played so many ingenues in the past, clearly enjoys playing a totally unscrupulous character for a change. She shows us that everything Pearl does or says has been calculated for the advantage it will be to her. Even helping her sister Bessie to a titled husband is something Pearl does because of the glory that will accrue to her for her matchmaking skills. Laurie Paton is wonderful is Minnie. She accomplishes the difficult task of portraying Minnie’s desire for Tony both as comic and pathetic. We see that beneath Minnie’s gaudy exterior and prickly manner is a lonely, unhappy woman vainly trying to maintain the illusion of youth. Julia Course uses a jarring, unmodulated voice in the early part of the play to emphasize Bessie’s Americanness and general naïveté, but after the big revelation in Act 2, she moves her voice into a lower, more pleasant register to underscore Bessie’s new chastened view of the world. That low, modulated voice Catherine McGregor already commands as Flora, the only one of the three titled American women who admits to others the unhappiness of her present existence and even a nostalgia for life in America. McGregor gracefully demonstrates that a nobility of purpose is more important than a nobility of title and because of that makes clear why Flora serves as a confidant for bewildered young people like Fleming and later Bessie. Wade Bogert-O’Brien, who for the last two seasons has been expert at playing intense young men, plays yet another as Fleming. From his stony expression and barely controlled impatience, we can tell quite clearly before he says a word how the sordid gossip and cruel repartee of Pearl’s social set disgusts him. Well-brought up, his Fleming tries to be as polite as he can, but his exasperation that Bessie should be dazzled by life in Pearl’s company is visible even before we know that he had any connection to Bessie back in the States. Neil Barclay is amusing as Thornton Clay, whose Virginian accent is obvious even though he deceives himself that he sounds completely British. Lorne Kennedy manages to make old sensualist Arthur Fenwick both comic and slimy at the same time. Charlie Gallant is excellent as Minnie’s kept man Tony, who knows just how to manipulate Minnie emotionally to get whatever material goods he wants. In contrast to these, Ben Sanders plays the only Englishman in Pearl’s set who is able to strike a note of sincerity. That he can do so is quite an accomplishment given the generally satirical atmosphere of the play. In minor roles, Anthony Bekenn’s eye-rolling and strained tone of voice do much to intimate the low esteem in which Pearl’s butler Pole holds his mistress and her crowd. James Pendarves provides a last-minute breath of fresh air as the energetic dance instructor Ernest. It is a relief to see that Panych has focussed in such detail on understanding the characters in the play rather than in deploying some of his standard directorial tricks, but some remain. He does ask video designer Craig Putt to project black-and-white scenes of London on Ken MacDonald’s all-white set of Act 1, but they serve no purpose both because the text makes clear where the action takes place and because projections rippling over the furniture and concave walls are difficult to decipher. While MacDonald’s set for Act 1 is gorgeous, he really overdoes his set for Acts 2 and 3 representing Pearl’s husband’s ancestral pile in he country. He has two demonic gargoyles overlooking the scene but since when do gargoyles appear indoors? He also makes the vines on the wallpaper crawl off and wind about the wainscoting and the floor. It’s a fun idea but too fantastic for an otherwise naturalistic play. Charlotte Dean’s costumes well capture the period in Act 1, but in Act 2 the women’s outfits look far too much like variations of the same style in the same materials and do little to convey the women’s differing personalities. These objections are minor in a production so hugely entertaining and insightful. One might think that topic of American heiresses marrying Europeans for titles would have become dated by now. In fact, the play, unfortunately, still resonates as a critique of the general pettiness and out-of-touchness of the super-wealthy whose preoccupation for continually advancing their own position blots out any concern for common morality or for helping those less fortunate than themselves. Maugham reveals that the wealthy and privileged can be termed “our betters” only with the deepest irony. Photo: (top) Claire Jullien, Julia Course, Catherine McGregor and Lorne Kennedy; (middle) Laurie Paton. ©2013 David Cooper.